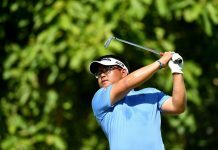 Labuan, Malaysia, September 29: Thailand’s Panuwat Muenlek posted the day’s lowest score of five-under-par 67 to move to the top of the leaderboard, sharing the third round lead with Malaysia’s Shariffuddin Ariffin and Blake Snyder at the PGM Labuan Championship on Friday. Singapore’s Choo Tze Huang also surged into contention following a 73 which placed him just one shot back of the leaders in outright fourth place at the RM200,000 (approximately US$44,600) Asian Development Tour event. 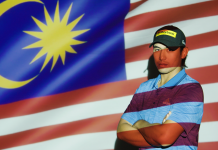 Malaysia’s R. Nachimuthu and South Africa’s Mathiam Keyser posted a 72 and 71 respectively share fifth place at the Labuan International Golf Club. 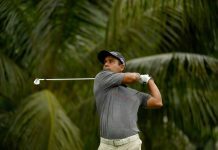 Starting the day in tied-seventh place, Panuwat quickly fired two birdies in his opening two holes to make his move. He dropped a shot on the fourth hole and parred the next three holes before play was suspended due to heavy rain. 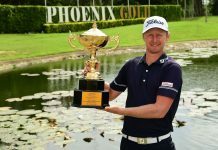 When play resumed, Panuwat marked his card with another birdie on the par-five 10 before cruising home with further birdies on holes 14, 16 and 17 for a three-day total of six-under-par 210. “I putted really well today. And it was good considering it was raining heavily today. The greens were soft and the course was playing longer. “I took advantage of my putting which has been excellent and I’m happy to be heading into the final round with a share of the lead,” said Panuwat, who holds three ADT wins. By featuring on the ADT schedule, the PGM Labuan Championship will offer Official World Golf Ranking (OWGR) points. The winner will receive six OWGR points while the top six players and ties will also earn points based on a sliding scale.